We are still a few months away until Summer, but its time to start looking into BC wine events happening in the Okanagan as event tickets sell out fast and you will want to book your accommodation. 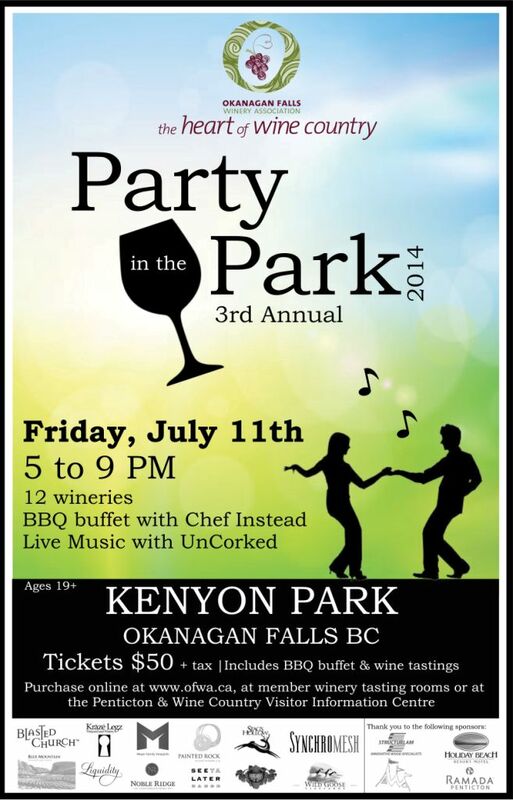 One event that may be of interest, is Okanagan Falls Winery Association Party in the Park, happening on July 11th on the shores of Skaha Lake. This fun party will feature award-winning wines from 12 member wineries, a delicious southern BBQ buffet prepared by Chef Martin Laprise and live music. Shuttle transportation available from Oliver and Osoyoos through Unveil Shuttles or from Penticton through Grape Escapes. Accommodation specials available through Ramada Penticton (contact Gord at gm@pentictonramada.com) and Watermark Resort in Osoyoos (contact Courtney at cfossett@watermarkbeachresort.com). Tickets are $50- purchase at member wineries, Penticton&Wine Country Visitor Information Centre or online here. For more event listings in the Okanagan, visit our events page.